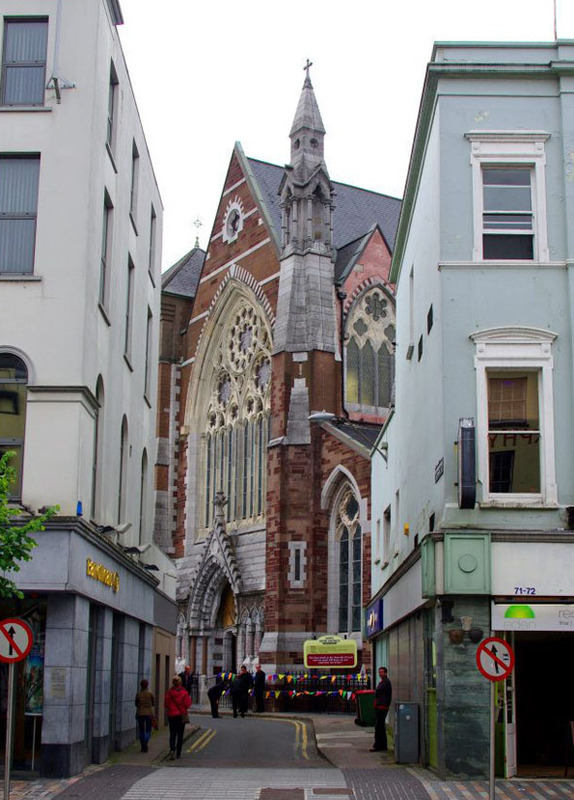 Architecturally one of the finest churches in Cork city, the church was dedicated for worship on 29 June 1866. After an architectural competition was held in 1859, E.W. Pugin was awarded the commission to design the church even though he was not the winner of the competition. It replaced an older church, built in 1786, which was entered from Carey’s Lane and known as Carey’s Lane Chapel. Sadly the proposed spire was never completed. The high altar was designed by George C. Ashlin and executed by Samuel Daly. In 1875 a new pulpit, again designed by Ashlin, and sanctuary stalls were added. “A brief notice of this building with particulars collected during a recent personal visit, was given in the July No. 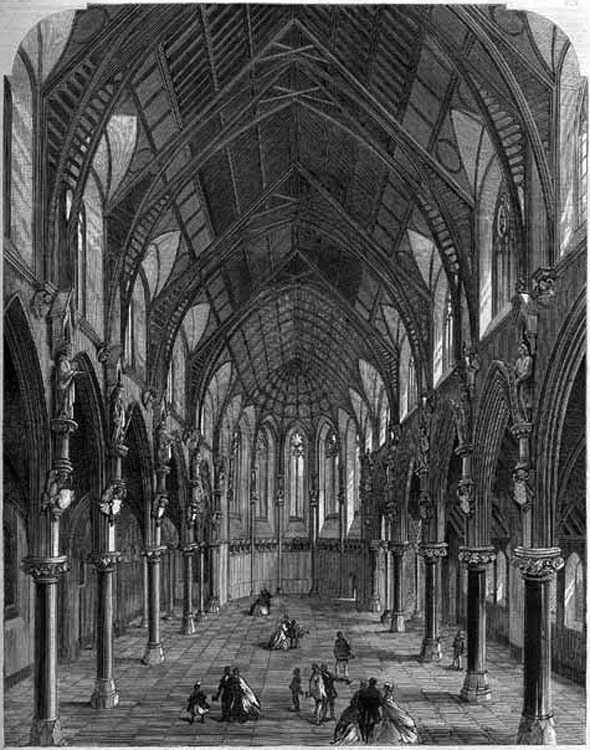 of this journal, and we now present our readers with a view of the interior looking towards the chancel, and engraved by Mr. Hanlon from a photograph furnished to us by the architects, Messrs. Pugin & Ashlin. As already stated, the site for the church is by no means favourable to the display of its beautiful features, and must not a little interfere with the pardonable vanity of the architects, who, as a matter of course, would have preferred to have had its parts displayed to the best advantage, and not with its “light hid under a bushel,” as unhappily is the result of the site chosen, let who may be to blame. Even to obviate this difficulty in a degree hereafter, an expenditure will be necessitated, which, if our information as to financial matters be correct, will prove quite impracticable; it is, therefore, a subject for regret by all concerned with the under taking and by the citizens, that this truly handsome architectural work on which an important sum is being expended, should be so completely obscured that a stranger shall have to seek for it, and experience a difficulty in discovering what should be a prominent and conspicuous feature amongst the monuments of the city, The length of the church—which is cruciform on plan, and comprises nave, aisles, transepts, chancel, &c., -is in the clear 145 feet by 80 feet, the nave being 35 feet in width, and the height to apex of roof 87 feet 9 inches. The construction of the roof presents some noteworthy features, and the proportions of the arcades separating nave from aisles are graceful and lofty. Five two-light windows with plate tracery heads, light the chancel,which is semi-dodecagon in form, and measures 35 feet by 17 feet 6 inches in clear. A handsome tower 27 feet 3 inches square at the base tapering to 25 feet 3 inches, and surmounted by a beautiful spire attaining.” altitude of 232 ft., is to be placed at the western end. The materials employed throughout are Glanmire red stone for walling, line stone for the dressings of doors and windows, quoins, &c., and Portland for the tracery. The shafts of the arcade piers are of marble, with polished limestone bases and caps; those in the chancel are of Connemara green, and the ornamental portions of Caen stone. The cost, exclusive of tower and spire, will be about £11,000; the builder is Mr. Barry M“Mullen, and the clerk of works, Mr. Langford”. The Irish Builder, August 1 1860.